This club was started with an aim for creat-ing social awareness and enhancing student’s understanding about the inter-dependability of human beings and our environment through various activities at Prakash College. To sensitize and mobilize students’ participation for preservation and conservation of environment, Nature club organizes multiple numbers of competitions that bring students closer to the nature and makes them realize the importance of an eco-friendly environment. Students are encouraged to participate in such activities whereby the need to conserve nature’s bounty is imbibed in them naturally. Our traditions often collide with the envir-onment, especially during the festive seasons. So it doesn’t come as a surprise that during celebrations we harm our environment and the pollution meter goes up. 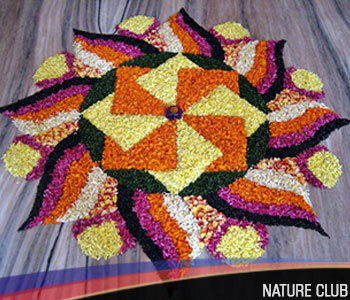 Keeping this in mind the Nature Club organized the Eco- Rangoli competition on 17th Nov 2014, to bring to the notice of students that out of many ways eco-rangoli is one, which we can bring into action and do our bit in saving our environment. The competition was a success as students promoted the use of pollution free products during competition. 11TH July is celebrated as World Population day worldwide. Prakash College also celebrated the World Population day by creating awareness among the masses about the exploding population year by year. The aim behind celebrating this day is to protect and empower the youth of both gender and to offer them detail knowledge about the sexuality and delay marriages till they become able to understand their responsibilities. Students prepared posters, articles and poems around the theme of Nature Colour Day. The day ended peacefully and the aim was successfully achieved. Holi & World Happiness Day Celebration..!!! !